The Expendables 3 continues to be Movies In Focus’ most anticipated movie of this summer. Forget about battling Autobots, comic book sequels, updated fairy tales or young adult adaptations – Patrick Hughes’ action extravaganza is the movie to beat as things heat up in and out of the cinema. It’s a summer movie from another time, a time when muscle, brawn and sinew ruled, a time before CGI made even the most impossible human feat possible on screen. Hughes and Sylvester Stallone (the franchise’s godfather) have assembled a cast that would make Ocean’s Eleven quake in their shiny shoes. A cast so powerful that it boggles the mind – the men who ruled the box office in the 1980s and 1990s, before comic book geeks and metrosexual males became de rigueur. We’re taking about the men who played Rambo, Blade, The Terminator, Zorro, Indiana Jones, Mad Max and …err…Frasier. Joking aside, this is a cast that would have melted the minds of any studio executive who could even have pondered it, however this action fan’s dream has now become a reality. In a way the first two highly enjoyable Expendables were trail runs for this third (and some say final) film. It looks like Stallone has finally created the perfect recipe and the ingredients are first rate. The first Expendables teased us with the brief scene where Stallone shared the screen with Arnold Schwarzenegger and Bruce Willis, but that was only a taster for what we would get when the three icons went into action (with a succulent side helping of Chuck Norris) and battled Jean Claude Van Damme. This time, Willis may be out, but Stallone has added a dash of Harrison Ford, Mel Gibson and Antonio Banderas (who join franchise staples Jason Statham, Jet Li, Dolph Lundgren, Randy Couture, and Terry Crews). Ford, Gibson and Banderas add an authenticity to the movie, showing that the law of diminishing returns doesn’t apply to this franchise. In fact, it just keeps getting better as Stallone and company perfect the ultimate slice of action cinema. The Expendables was a gritty old-school actioner that followed Stallone and his titular mercenaries as they went into action in Latin America. The sequel upped the comedy and the supporting roles, making a more enjoyable action experience. With The Expendables 3 Stallone and Hughes appear to have mastered the formula, creating the perfect balance of action and humour. Red Hill showed that Hughes could deliver a stylish action film on a low budget, and The Expendables 3 looks like he can rise to the challenge when the stakes are raised. It takes a brave man to direct a $100 million movie as his second feature, an even braver one to to it with a cast of this magnitude. 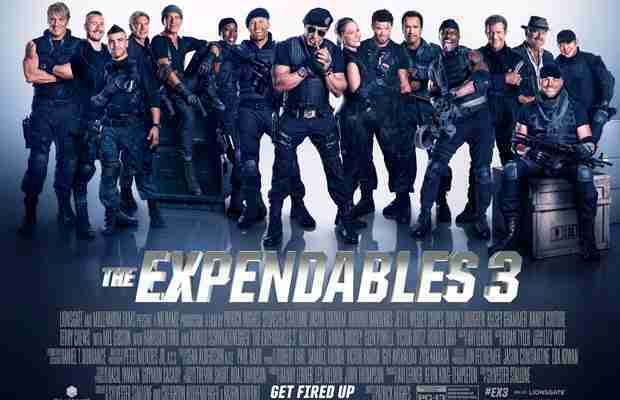 The cast alone makes The Expendables 3 a must-see film (even the poster tingles the cinematic senses). The fact that it looks like a a highly enjoyable, slick old-school summer action movie only adds to the excitement. The Expendables 3 isn’t just anticipated viewing – it’s essential! The Expendables 3 blasts onto screens in the UK on 14th August and on 15th August in the US.